Priory Quay offer the widest range of High Quality British made and HSE conforming cabinets. 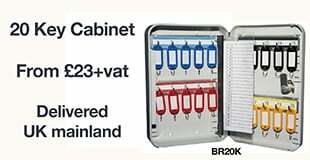 Priory Quay offer the best UK Hazardous Storage Cabinets in a wide range of Sizes and Colours. Suitable for pesticide, chemical and flammable liquid storage. All cabinets meet the requirements of the Highly Flammable and Liquefied Petroleum Gases Regulations 1972 (Section 5 Part D), The Health and Safety Executive Guide HS(G)51 1990 and the Factory Inspectorate Certificate of Approval No 1 Parts 3 and 4. The maximum volume of any flammable liquid with a flashpoint below 32_C that may be stored in a flame resistant cabinet within a workroom is 50 litres (regardless of the total capacity of the storage cabinet).